Team Catford is leading a programme of meanwhile use to ensure we make the most of vacant spaces as the long-term process of regeneration takes place. 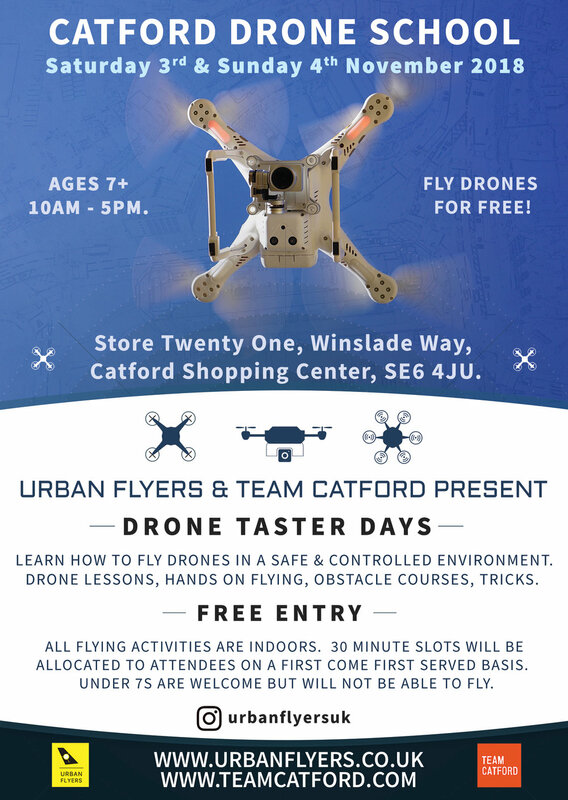 As part of this programme and to celebrate their launch in Catford, Urban Flyers are holding free ‘Drone Taster Days’ which offer local residents the opportunity to access, learn and create with drone technologies. The event will be held between 10am-5pm on Saturday 3rd and Sunday 4th November 2018 at Store Twenty-One (opposite Poundland) in Catford Shopping Centre SE6 4JU. Urban Flyers organises workshops, training and drone experiences that help young people and adults get to grips with drone technology. Their workshops are an opportunity to learn new skills and they’ve been visiting schools, youth clubs and inclusion centres to deliver their drone clubs throughout local communities. The Drone Taster weekend will consist of hands-on flying experience by manoeuvring the drones through different obstacle courses. All flying activities are indoors and 30 minutes slots will be allocated on a first come first served basis. Everyone aged 7+ is welcome to come along, meet the Urban Flyers team and ask questions. Under 7’s can attend but will not be able to fly. Newer PostDoes the Catford feedback reflect your views?